Fleet Street Kitchen – eating my way through Charm City! I have recently become a regular at the Bagby chain of restaurants. And, my opinion of the group is starting to improve. I hadn’t been a huge fan – I found them a little stuffy, lacking some novelty and slightly overpriced. While at the Yards beer dinner, I realized that I may have been too judgmental and I decided to head over to Fleet Street for happy hour and a 5 course tomato tasting. Plus, they have 1000 point tables on open table – so why not? They gave me a little hassle when I asked to just sit at the bar, which was EMPTY at 5pm, but they gave me the points and a menu anyway. It was a joy to see GM Matt and the beverage director Tim, who were super friendly and helpful (although the valets were absolutely not… Please go see my friends Amadu, Harouna and Stanford over at the four seasons – just a few dollars more, but worth EVERY PENNY and the 2 block walk – even if you are in heels). I was super excited when I saw one of my favorites from Wit was working behind the bar. Holly took great care of us walking us through the menu and giving us a great wine recs. I am not sure I needed them, because I was going with the rosé. It was the right choice; it really complemented tomato dishes. This one worked expertly, very clean, but crisp enough on the palate to bring out the sweetness of the fresh heirloom tomatoes. I would like to find a few bottles to keep in my fridge for the summer. My mom and I split an order of five of the seven tomato tasting courses (for $36), starting with the caprese salad – chunks of fresh red on the vine tomatoes and a huge ball of housemade burrarta mozz. I need to you to honestly think for a second about the size of that mozzarella ball – easily the size of my small fist. This is one of my favorite combinations – the salty creamy cheese combined with the crisp sweet tomatoes and garnished with a heavenly fragrant olive oil and spicy kale and cilantro pesto. My mom would have preferred basil – but not this girl! I really appreciated that they brought the courses one at a time. The next course to arrive was the tomato and cantaloupe. Small diced tomato bites and melon balls tossed in a melon coulis (which is basically a purée), surrounding a ball of tomato sorbet. 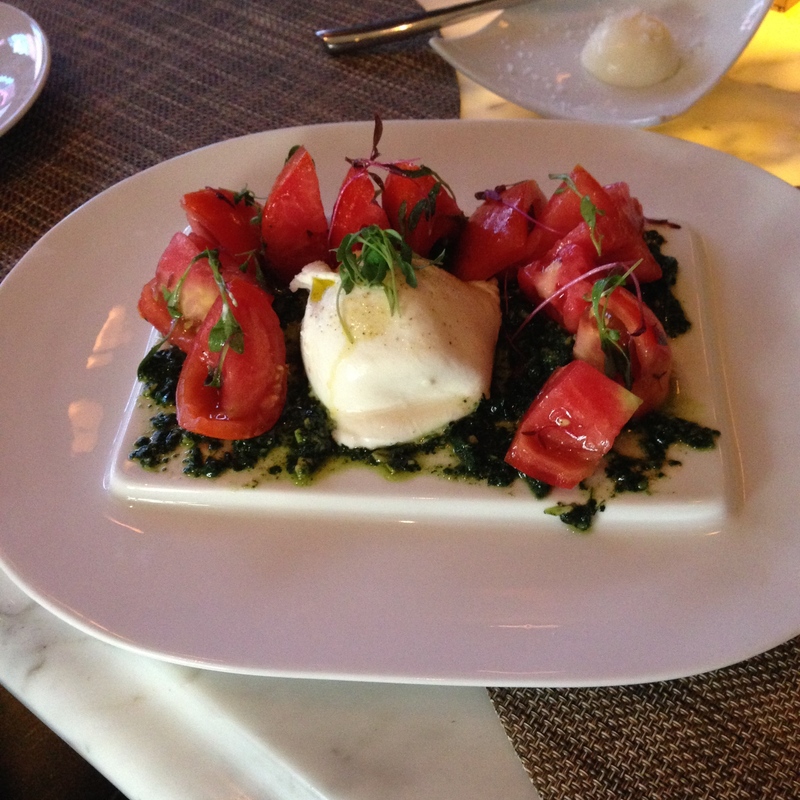 Yes… I said tomato sorbet. I wasn’t sure about that, but then I tasted it – smooth, rich tomato flavor in one chilled glorious bite. I’m dreaming about that right now. It turns out melons go with just about everything – sorry to my poor friend, who is allergic, you’re really missing out. The texture combination was well played and the flavored truly harmonized in each bite. I was most excited for the tomato tartar. It sounded the most unique; tiny bites of red tomato with bright yellow green banana peppers and beautiful sweet juniper berries. It was very pretty. I’m so sorry I don’t have a picture. Flavor and texture wise, this one missed the mark for me. The tiny chunks of tomato were a little mushy and I don’t like banana peppers (or juniper berries, for that matter) enough to add them to each bite for contrast. The sharpness of the peppers kind of took over the plate. Next we had your traditional meatballs in tomato sauce – oh my goodness – the grass-fed beef and pork lends itself perfectly to the hearty robust flavor of these heirloom tomatoes. They were served in an adorable cast iron skillet. Don’t you worry, I sopped up every last bit of sauce with their homemade bread. I think they made this one with four different heirloom tomatoes. These were so good, I think almost everyone in our party shared another order – they are on the happy hour menu every weekday from 4-7… Hooray!!! Last, but not least was house made and hand cut linguine with a very light garlic cream sauce tossed with roasted mushrooms and sungold tomatoes, these are small little yellow/red tomatoes. I love the texture of fresh made pasta cooked to a perfect al dente. It almost melts in your mouth, but is firm enough to round out the dish. The mushrooms and flavors melded nicely, but the those tomato halves – a burst of juicy goodness. 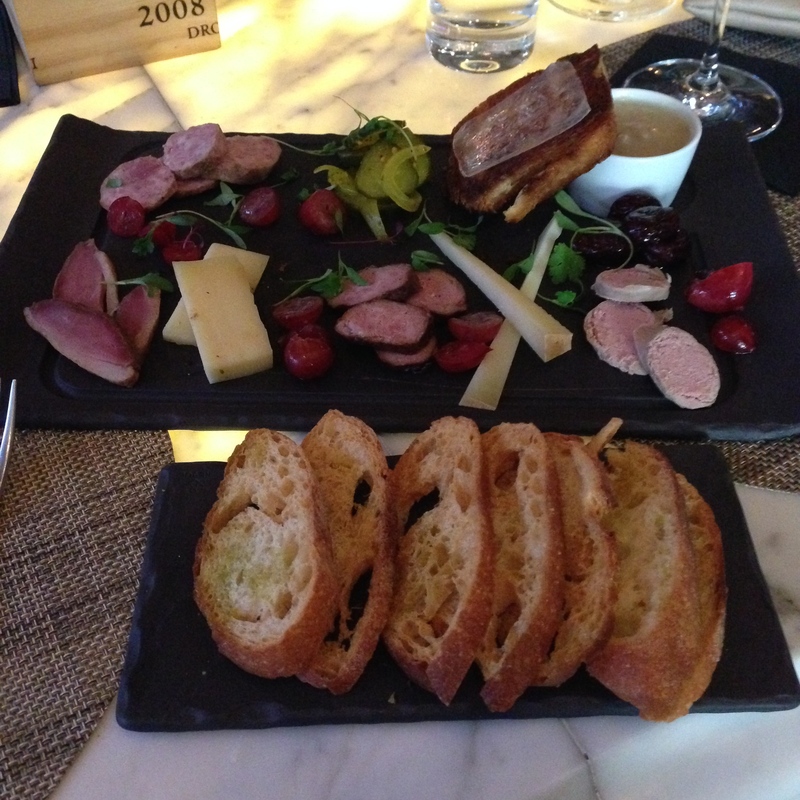 Luckily, we were there long enough to partake in a few nibbles of the charcuterie and cheese plate. This was not my favorite and I love charcuterie plates. I think we only ate the duck bacon and the Belgium sausage. My favorite part of this plate was the bread and the red gooseberries. This one had a few things that were a little too out there for me – like lard on what a toasted brioche piece of toast and a little dish of meat that was so much fat, it kind of rose to the top and you had to stir it all together. Plus, it only came with a few bites of cheese. I have a friend who doesn’t really like the meats, and really just wants the cheese – skip the happy hour charcuterie and go with the regular menu cheese plate. This entry was posted in All Good., Charm City, Downtown/Harbor, Happy Hour, Harbor East. Bookmark the permalink.